It won’t surprise regular readers that I’m a triathlon geek. 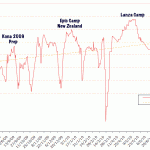 Analysis of training and racing data are regular features of this blog. Whilst mileage can motivate me what really fascinates is the gradual adaptations and how they show within the data. Downloading a ride is typically my first activity on arriving home. Collecting data is only as useful as its application. Coming from a scientific and IT background I’m an analytical person and like digging into systems and numbers. A large body of data allows me to identify patterns and changes over time. Benchmarking changes in fitness is key to tracking performance. Without standardised testing to compare training against you can’t determine how hard a session was. Concepts like perceived exertion are based on feel not facts. They’ll tell you a lot about your condition on the day, but little about the work you did. The best measure of performance is a race itself, but most athletes won’t race enough to closely track performance and if they do race conditions vary. You may be tapered for one whilst another is part of a training block a poorer performance in the latter wouldn’t be surprising. Simple, repeatable tests in each sport give a means to monitor fitness in a controlled way. Repeatability is essential – conditions need to be consistent to ensure that adaptations are improving results. By their nature test sessions are challenging workouts and require recovery time. They shouldn’t interfere with your program if well planned and will provide an intense session in their own right. There are hundreds of ways to test yourself. It’s important to pick a method that works for you and gives an indication of the relevant aspects of fitness for your sport. As an aerobic endurance event testing aerobic fitness is the obvious approach for triathlon. The tests you use are dependent on the tools you have. You don’t need the best or most expensive pieces of monitoring equipment to effectively gauge performance. I’ve outline a few methods I’ve used on myself or athletes I’m coaching below. 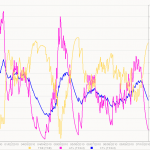 Power is the ideal way to track cycling performance. It’s an absolute measure of forces applied at the pedals and those forces come down to the athlete’s performance. Power meters are expensive so I’m well aware not everyone has one. 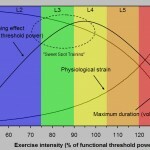 For those that do I tend to recommend a couple of approaches to measuring Functional Threshold Power (FTP). FTP is the maximum power you can sustain for an hour and an excellent benchmark. It’s difficult to test in training as it’s hard to keep the motivation up to ride all out for an hour. Using a 25 mile time trial or similar event is the best way to gain the extra motivation for a full hours effort. If a time trial isn’t an option there are other ways to estimate FTP (have a look at the seven deadly sins before you pick one). I opt for a test based around two 20 minute all out efforts with 2 minutes easy between them. I’ll estimate FTP at around 95% of the average power for that 42 minute period. It’s an estimate, but the test is easy to perform, consistent and good training in itself. I’ll be honest that whilst I’ve used the test for benchmarking cycling with my athletes it’s a while since I’ve done it myself. That’ll be rectified soon, but whilst travelling I tended to be slack on the testing front. I took the approach of looking at training data for signs of improvement (frequently riding sessions at higher intensity) and to estimate FTP. Very rough, but quick and easy. For the majority of athletes without power meters determining a functional threshold heart rate and pace is probably the best approximation. I’d highly recommend doing this on an indoor trainer and noting your set up. Remember repeatability is key to tracking changes as we want to eliminate variables other than changes in fitness. On your turbo perform the same test I outlined above (or if you’re up to it a full out hour). Assume the heart rate you record for that time is a reasonable estimate of your threshold, but also note the average speed or distance covered. Depending on how well trained you are you’ll find threshold heart rate may not change that much (though training could raise it). We’re looking to track changes in the pace at threshold heart rate. Pace can obviously be affected by external conditions which is why it’s important to try and keep the environment the same. You could test outdoors on a suitable loop, but be very aware that it will be harder to compare tests. Pace is my preferred method for measuring run performance. I’ve not run with a heart rate monitor in years as I judge effort by feel. Pace is a close analogy to power though for complete accuracy allowances need to be made for terrain. If you use a GPS or similar device then this can accurately track your pace throughout an entire run. Alternatively like me you can determine an average speed for the entire run and use it as an approximation. I generally don’t use specific tests with running relying on recent race PBs to guide me. Following FTP I want a threshold run pace based around an hour’s all out effort. Depending on the speed of an athlete I’ll approximate from a 10K, 10 miler or half marathon taking the pace from which ever is closest to an hour. The lack of specific test sessions comes from my run bias. I love to enter run races throughout the year so testing is a regular occurrence. It clearly falls short of the repeatability aspect unless you’re racing the same course each time. To really make the most of pacing you do need some form of consistent time trial. Consider this a warning to my athletes who haven’t done a run test yet I can see 5K time trials in your future! I’m utilising 5km as the basis for my test though it’s not close to the hour. It provides repeatability and is an aerobic event so dependent on threshold heart rate. The overall impact of this hard session will be much less than a full hour and can fit into a training week more easily. Time trialling a run for an hour is mentally tougher than the bike in my opinion. If you run with heart rate then log this to determine a threshold heart rate and pace for your run. The initial test will establish the baseline for all future results. As training progresses we’re looking for an improvement in pace over 5km at threshold. That will be the sign that run fitness is improving. By far the most measured of all the disciplines swimming lives by the clock. I think everyone has some kind of metric for swim performance even if it’s a casual 100m PB. Whereas the hour is the basis for measuring performance in bike and run for swimming I like the concept of Critical Swim Speed (CSS). Critical Swim Speed defines a pace for 100m from which you can determine the intensities of all other training. The value aims to give you a swim pace at aerobic threshold so effectively the same as the previous tests. I use a slightly different version to the standard test which I picked up in Oz. Rather than two 50m efforts and two 400m efforts I opt for six 100m all out efforts with brief pauses after each taking the average speed of the six. Like the standard test it aims to eliminate the anaerobic component of shorter distance swims. By the sixth rep you shouldn’t have much capacity to work anaerobically (and if you did too much early on you’ll have slowed more). I usually back the CSS testing up with a further 1500m time trial just to keep check on endurance for athletes racing longer distances. The combination of the two give a swim pace to train with and highlight any weaknesses in an athlete’s endurance. There are far less issues in terms of repeatability as pools are a much more consistent environment. With swimming’s lower impact the opportunity to do regular tests is there too. Remember testing is training. Once you have benchmarks you’ve the ability to track progress and also more effectively structure training. Being able to train close to your thresholds is very effective at stimulating adaptation. It’s also tiring so needs to be balanced with other intensities in your training program. You’ll have seen references to threshold sessions in my sample Ironman training plans. These key sessions are focussed on working for extended periods around the threshold mark with structures similar to the tests themselves. It’s important to spend time in this region, the real key is to spend as much as you can whilst still recovering successfully. There’s a lot more that can be done once you start analysing your training. I’ll move on to the topic of Training Stress and performance tracking in a future post.